The original recipe called for a pork loin roast, which I didn't have. However I did have thick slices of pork loin which is pretty much the same thing. 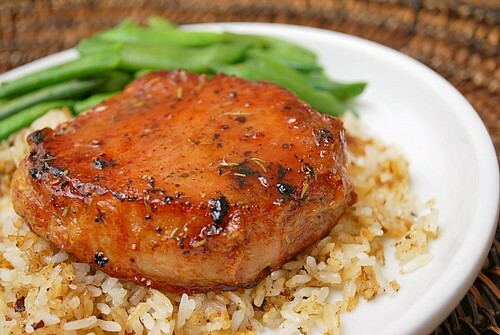 In fact, I thought this was better using slices so that you could really enjoy the flavor of the sweet glaze. Making this couldn't have been any easier. After seasoning the slices of pork and pan searing, a simple glaze made with maple syrup and dried rosemary was made in the same pan. The pork is placed on a baking sheet and the glaze is poured on top before baking to finish in the oven. This recipe could probably work nicely with chicken too. I served this over toasted garlic rice pilaf and steamed sugar snap peas. Preheat the oven to 325 degrees. Season both sides of each pork chop/pork loin slice. Heat the oil in a heavy bottom skillet over medium high heat and when it just begins to smoke, add the pork. Sear on both sides until well browned, about 3 minutes per side. Transfer the seared pork onto a baking sheet and set aside. Drain off the fat from the skillet; add the maple syrup and rosemary. Cook until fragrant, about 30 seconds to a minute. Place the pork back into the skillet to coat with the glaze and place the pork back onto the baking sheet. Place the glazed pork into the preheated oven and bake for 15-20 minutes or until the pork registers about 135-140 degrees. Allow the pork to rest for a few minutes before serving. mmm not only glorious but also perfect!!! it looks so absolutely soft, fluffy and gorgeous!! perfect with a red wine on afternoom !